Milkweed is an herbaceous plant with many species. It is famous as being the sole food of the larvae of the Monarch Butterfly. It is also the sole food of some other insects. It grows by seeds and rhizomes. Carl Linnaeus the famous Swedish botanist, physician, and zoologist named milkweed Asclepius after the Greek God of healing. This was because milkweed was extensively used for medicinal home remedies in the 1700’s. This plant does have toxic alkaloids but it is much less toxic than many other plants. Only rarely has been it been reported to have bothered people or animals. Scientists have studied the large number of insects that are able eat Milkweed. The insects that eat Milkweed develop an unpleasant taste and some protection from predators. However these insects do get eaten by birds and other animals. So as a producer in the food chain, the milkweed plays an important role in helping wildlife survive. Actually, this plant is edible if it is boiled in fresh water, using two or three changes of water. Very small stalks (10-15 cm tall) can be used like asparagus and firm young pods...like okra. Some First nations people ate the young pods during their western hunting and gathering trips. Many First nation tribes used an extract from the plant as a poultice on swellings. The milky sap was used to treat skin problems—cuts, burns, infections, ringworm and even warts and calluses. The root, both fresh and powdered, was used to treat a wide range of complaints. It was taken as a sedative, and used for digestive disorders, intestinal worms, kidney problems, rheumatism, asthma, venereal disease and as a contraceptive. Seeds were used to draw poison from snakebite or added to salves to treat sores. It has also been reported that some First Nations people dried the juice from broken stems and used it as chewing gum. The dried pods served as spoons. 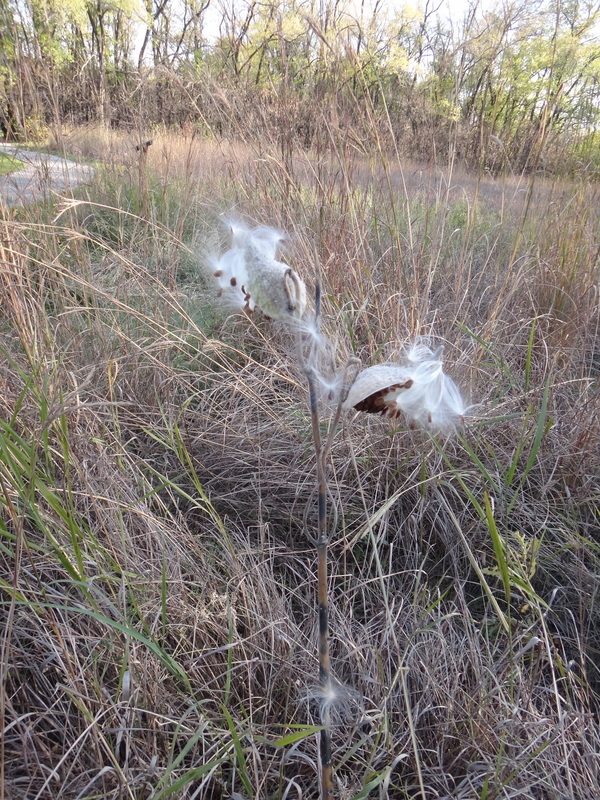 Milkweed floss is called wild cotton. It is water repellant and insulating when wet (because its hollow fibers are coated with wax) and was collected by the tons during the World War 1 and used as insulation and for the production of life jackets for soldiers. Like the relative Indian hemp, the inner bark of milkweed can also be twisted into string or rope. The fluff of milkweed makes excellent tinder in fire starting. Milkweed is a rich and abundant source of nectar for pollinators especially bumble bees as well as many other types of insects and humming birds. Bumble bees unlike honey bees are able to continue pollination even in adverse weather condition such as cold or rainy weather. The bumble bees then pollinate plants even during poor weather or in the spring or late summer. Milkweed helps many other plants in the ecosystem reproduce by supporting the lives of the pollinators. In turn, the plants that are pollinated help the survival of insects, birds and other animals by providing food and cover. In response to the drastic reduction of the populations Monarch butterflies, scientists and environmentalist have urged landowners—especially in the Midwest—to plant milkweed to help the monarch butterfly. Ontario has removed milkweed from its Noxious Weed Act to help save the endangered Monarch butterfly. Ontario will benefit the Monarch butterflies and Ontario's wildlife in general because of the many insects that are nourished by its leaves and nectar.